Drillin? & Drivin? Rig Ringers! Country singer and disc jockey Slim Willet?s ode to tool-pushin?! 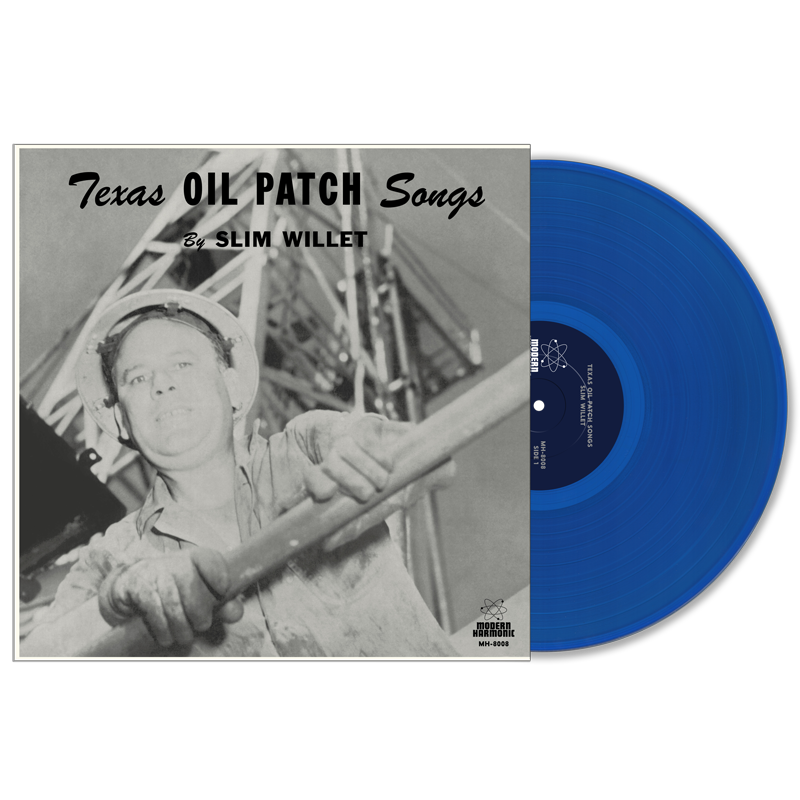 Texas Oil Patch Songs was issued in 1959 by the artist on his own Winston label, and now is an impossibly-rare LP to dig up?and this Modern Harmonic edition is faithful to the original, including all twelve tracks, liner notes, and restored artwork! And on petro-blue vinyl! "Ahh? the ?Concept Album? ?Critics write of Sinatra?s In The Wee Small Hours?or of groundbreaking 60?s rock opera opuses?but while the big studios set the scene for rainy night walks or drug-fueled psychedelic trips, a Great Lost Treasure from the Great Texas Oil Fields lay buried deep in the bargain bins of Saint Peters? Holy Blood Of The Christ Thrift Store! For sure, Slim Willet?s mighty collection of blue collar, well-digging classics stood little chance to begin with ? only a few hundred were pressed ? and, well, oil songs never really caught on in the way the similar trucking-songs boom would several years later. Maybe had Slim put this out during the great Gas Station/Truck Stop 8-Track Market of the 70?s this could have been a hit album. But, with Slim?s passing in 1966, it was never to be. Slim Willet (born Winston Lee Moore) was certainly a Big Fish in a Small Pond in the Independent Country Music World of the late 40s & early 50s. He?s best known for penning ?Don?t Let The Stars Get In Your Eyes,? a hit song for Ray Price, Skeets McDonald and Perry Como, all. Slim worked for many years with Bill McCall at 4-Star, made a stack of records as a singer, started his own Winston label, managed Dean Beard and various other hillbilly and rockabilly artists, but neve rreally hit the big time. His greatest masterpiece, 1959?s Texas Oil Patch Songs, was never fully appreciated?until now. For all the tool pushers, roughnecks, derrick men & chain hands, THIS is your soundtrack. ?